Blog | April 2018 | Trimcraft’s Monthly Craft Summary for March, Plus Monthly Competition Winners! Trimcraft’s Monthly Craft Summary for March, Plus Monthly Competition Winners! What a wonderful Craft Month it’s been! We’ve seen so many wonderful projects uploaded to the Inspiration area, and we’ve had lots of tutorials for you to try on the blog too! Getting your home spring ready can be made super easy with our Easter wreath tutorial. Using pretty ribbons and felt to create beautiful spring flowers, our wreath is adorned with an adorable Easter bunny. You can find Maxine’s step-by-step and our free template here! Did you know that the We R Memory Keepers Washi Chomper isn’t exclusively for cutting tape? You can also cut ribbon and paper with this tool. We love getting the most out of our crafty gadgets, so in this post Maxine showed you some innovative ways for using your using your Washi Chomper, including this stylish wall art frame. If you’ve made a delicious cake that’s in need of a finishing touch to get it ready for the party, then we have the tutorial for you! Kathy showed you how to create these adorable cake toppers using elements from the Let’s Celebrate paper pad from First Edition. Wooden lolly sticks are a cheap craft item to buy and what’s great is that they can be used in SO many different ways! For this month’s 3 Ways With… feature, Maxine showed you some great craft ideas with lollipop sticks, including a cute frame! Want to add a touch of floral fun to your home? We had this quick and easy video tutorial for you to follow earlier in the month, showing you how to create your own Floral Monogram Letter! We love Maxine’s twist on the classic aperture card, with its fun suspension element. The combination of Dovecraft Nature’s Grace papers and First Edition Swan die is a perfect match and with our easy to follow tutorial, you’ll be creating your own in no time. With the Easter holidays in full swing, you might want try our Kid’s Craft video tutorial! This fun frame is sure to keep kids and grandkids entertained for hours and it’s so easy to create – find out how here! We can’t get enough of Elle’s Easter Egg Pops. Super easy to make AND delicious – what more could you want?! These don’t just have to be for Easter, either, so why not treat yourself! 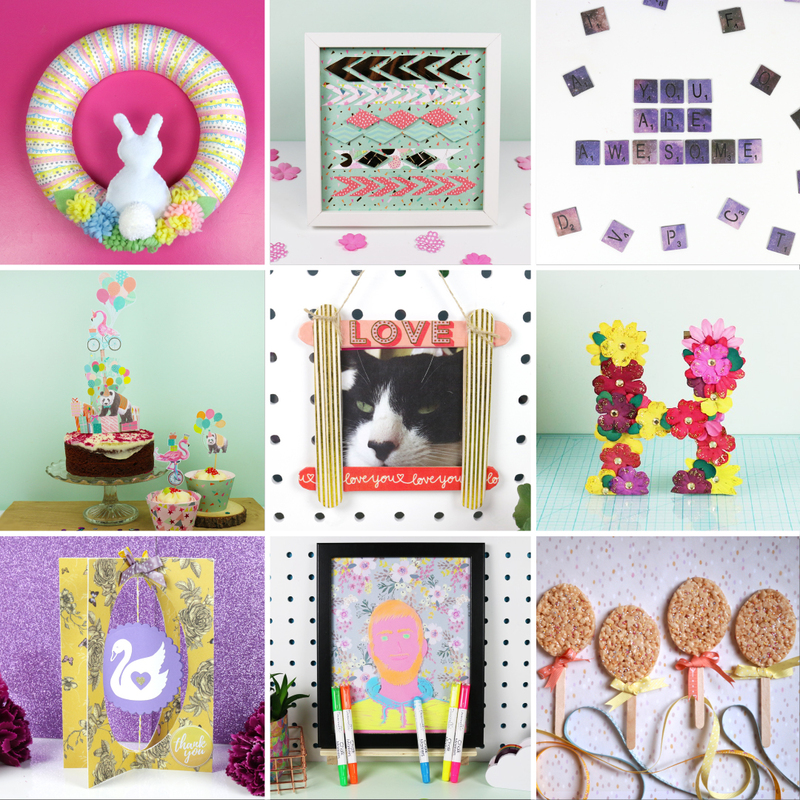 For this month’s Craft Challenge we asked you to create Easter-themed crafts! We had so many wonderful entries this month, however Easter Bunting project by Gingers girl really stood out for us. Congratulations! Choosing the Project of the Month is always a tough decision as we always have so many amazing project to choose from in the Inspiration area! However, the lucky winner is Mixed Up Craft, who created this stunning Gate Fold Shadow Box Card with the Nature's Grace papers. Congratulations everyone. Thanks Trimcraft for setting the challenges. It certainly sets the creative juices flowing. Our grand daughter loved the bunting that I made. Its been put away now until next year. Congrats! Your bunting is lovely! Thanks sooo much for all the amazing projects here this last month. There has really been a load of great stuff, just wish for moire time to try out all these fab projects too, can you help with that too? ha ha ha And a big congrats to this months lucky winners here too. Have fun ladies, you´re in for a real treat here. Big congratulations to all the winners, beautiful projects ladies well done.